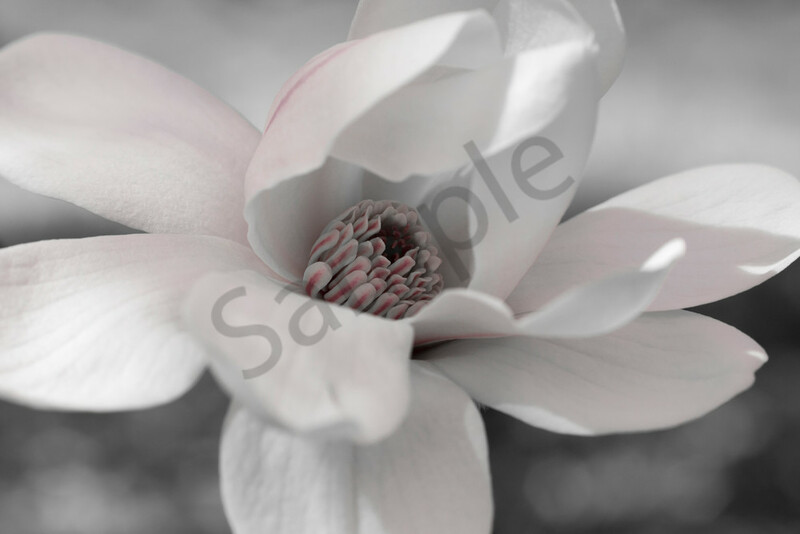 A fine art print of "Star Magnolia" will spark conversation in your waiting room, living room or office. Large, clean petals open in layers to reveal the reproductive core. A subtle blush of color breathes life into the black and white image. Add a dose of spring to your home! The Magnolia family is full of beautiful trees that bloom in spectacular fashion. The spring landscape is brightened with large, clear flowers and the sweetest of perfumes. One of my favorites is the Star Magnolia, a mid-size tree that serves up softball-sized flowers as the warmer spring days shake off the cold. Large petals open to reveal a tight cluster in the center with stylish red stripes. Using software I removed all but the magenta tones from the image, highlighting the ordered patterns and soft blushes on the petals. "Star Magnolia" is part of my Flower Wall Art series. Best displayed as a metal print, the details and subtle color changes are highlighted to captivate the imagination. Each metal print is ready to hang without a frame, providing a bold, modern look. For a softer, more pastel appearance, choose a canvas print professionally stretched over a wooden frame. Two museum-quality fine art papers are also available, should you prefer a more traditional look.